HAKA Sewing Furniture FAQs... sew much better! Sew much better with insights from HAKA Sewing Furniture’s in-depth responses to FAQs (Frequently Asked Questions) based on actual emails received. HAKA welcomes your comments or questions. What makes HAKA Sewing Furniture special? Quality workmanship and components, height choices, unique designs, thoughtful details, personalizing options and customizing capabilities. HAKA Sewing Furniture… sew much better! Does the cabinet height include the casters? My sewing table sits at exactly 29 inches from the floor. If I were to order HAKA's #IB-300 Low Storage Cabinet [with the ironing board] in a 29-inch height, could I place it and my sewing table side by side, sitting flush? 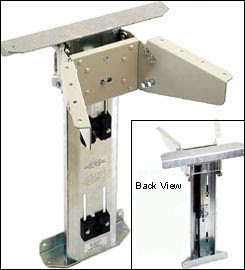 I'm not clear whether the 29 inch height for the #IB-300 includes the casters. My goal would be to have both table tops sitting at the same height. All of HAKA's sewing furniture is on casters. The furniture heights are measured from the floor to the top of the furniture (including the casters)... your 29" high sewing table and 29" high #IB-300 Low table tops will sit at the same height. I have a sewing machine and a serger. What furniture do you suggest for quilting? The #500's sewing and serging stations are situated side-by-side. There is a spacious back drop leaf to accommodate your large projects. The sewing and serging stations are situated across from each other in the centre of the table. A folding drop leaf on either side of the centre provides you with lots of room to the left of both machines for your large projects. Don’t need the cutting function? Make it a Combo and save 10% on the regular prices when you add a #300 High Storage Cabinet to your #1500 or #500 order. The #300 High has 5 drawers, with an optional pullout folding ironing board replacing the top drawer. Positioned to the left of your machines, the #300 will provide extended support for your large projects as well as handy storage. Will HAKA's sewing machine lift work with any machine? The original, and still #1, HAKA Sewing Furniture’s 3-position Tip-Matik sewing machine air lift will work with any domestic (non-industrial) sewing machine, serger or embroidery machine. How do I determine the appropriate height for my Cutting Table? You can select the Cutting Table height that is appropriate for you with HAKA’s "personalizing" cutting table height choice – 34" or 36" – this is truly unique in the world's sewing furniture market. -- When standing at the long side of your Cutting Table, you should be able to lean over to the middle of the table without disturbing your fabric. You can test HAKA’s standard 34" and 36" Cutting Table heights at home using your kitchen counter top (the standard height for a kitchen counter top is 36" - measure to be sure) and adding books to a table top to bring its surface up to 34". If neither of these heights feels comfortable, you may need a customized Cutting Table height… HAKA has customized Cutting Tables from as low as 32" to as high as 40"! You’ll find that when you have the right equipment for the task (which, most importantly, "fits" you), you’ll work more comfortably and consequently, more productively. What is a Cover Plate? Are Filler Plates the same as Cover Plates? They're different. A Cover Plate covers the machine cutout in the tabletop when your machine is at the storage level (bottom lift position). The Cover Plate has a finger hole for easy removal/replacement. HAKA provides a Cover Plate with its sewing furniture styles that don't have a top-opening leaf to close over the machine cutout. HAKA’s sewing furniture with a top-opening leaf to close over the machine cutout doesn’t come with a Cover Plate. However, if you want to leave this style of furniture open and cover your machine cutout, you can order a matching Cover Plate. If in doubt whether your HAKA sewing furniture comes with a Cover Plate, check out its list of features. What is a Filler Plate? I'm confused about Filler Plates. Why are they not required for my serger? A Filler Plate is an insert for your sewing machine. It's used to fill in the space between your machine and the cutout in the tabletop. You'll use your Filler Plate when you're sewing at the flat bed level (middle lift position), the level used for most sewing. In this position the sewing surface of your machine will be level with the tabletop. 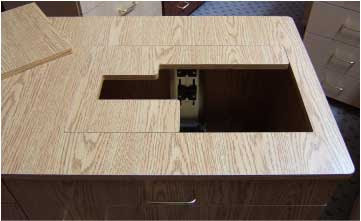 HAKA’s Filler Plate is made to match your sewing furniture and is custom cut to fit around the free arm of your machine (you remove your machine’s tool/accessories box when using your Filler Plate). A Filler Plate is not required for the serger due to the serger’s shape - a serger can be positioned flush with the front and left edges of the machine cutout in your tabletop. Why do my shoulders hurt when I sew? Can HAKA Sewing Furniture accommodate my new, big machine? I recently purchased a Bernina Artista 185 embroidery machine and am looking at buying a new sewing table for this machine. It is presently sitting on a table that is too high and it hurts my shoulders to sew for more than about an hour. Do you have a table/cabinet that will accommodate this machine and if so, how high is it, and what does it cost? I appreciate your help. You're right; your machine is sitting too high. Your shoulders hurt because you're forced to continually hold your arms up as you sew. This situation can also cause sore neck muscles, headaches and fatigue. Good news! HAKA Sewing Furniture can provide a "home" for your new, larger machine. All of HAKA's sewing, serging and quilting cabinets/tables can accommodate even the largest domestic sewing, embroidery machines and sergers. HAKA offers a personalizing sewing cabinet height choice.The height of your sewing cabinet plays a major role in your sewing comfort. How do you know what height is best for you? Sit on a standard height chair (approx. 17" high) with your hands resting on the tabletop in front of you. Keep in mind that with HAKA's Tip-Matik Lift (see below), you will be sewing with your hands at this level. Your elbows should form a right angle (90 degrees). For your sewing comfort, HAKA's Modular Style cabinets are available in a choice of heights: 28", 29" or 30". For more about choosing your sewing and cutting furniture heights, check out HAKA’s Height Tips. P.S. HAKA can customize your sewing furniture height to your specifications. For proper seating height for sewing, HAKA provides a #600 Low Storage Bench (for HAKA’s 28", 29" or 30" high Modular Style cabinets) and a #600 High Storage Bench (for HAKA’s 34" high Multi-tasking Style tables). See HAKA's Storage Benches. HAKA Sewing Furniture incorporates a precision-built Tip-Matik 3-position Sewing Machine Lift in all of its sewing, serging and quilting furniture. Thanks to this Lift, your sewing machine (AND serger) will sit "recessed" into your HAKA tabletop with your needle plate level with the tabletop. No more struggling to pull your fabric back up onto your machine when sewing - you can sew straighter seams. 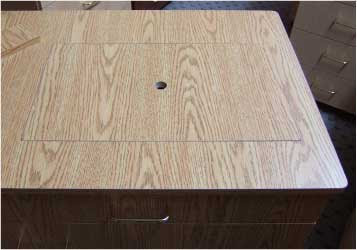 #1 Bottom storage position - This level is factory set so you can store your machine down inside your sewing cabinet. #3 Top "free arm" position - This level is factory set to bring your machine up to sit at tabletop level. This level is used for machine embroidery and for sewing pant hems, etc. around the free arm of your machine (the part that remains to the left of the needle when your machine’s tool/accessory box is removed). Simply push down on your machine – you’ll hear a "click". This is the sound of the automatic position-locking mechanism on the lift releasing. Keep pushing to lower your machine or let the Tip-Matik Lift raise your machine to the desired position. Your machine simply sits on the lift platform - there is no need to screw it in place. At HAKA Sewing Furniture, Pamela draws on 20 years of experience in designing and manufacturing sewing furniture to provide answers to your frequently asked questions about sewing furniture and related topics. What makes HAKA Sewing Furniture special?